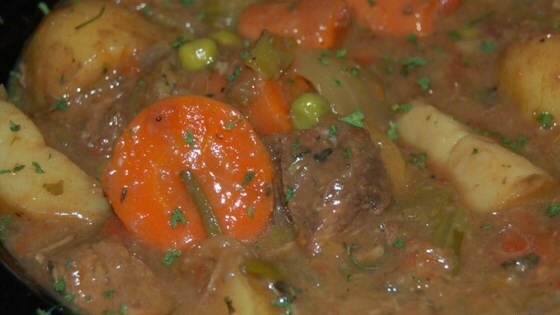 Place beef, tomatoes, celery, carrots, potatoes, onions, and tapioca into a Dutch oven. Season with beef bouillon, thyme, rosemary, and marjoram; stir in red wine. Place the lid on the Dutch oven. Bake for 5 to 6 hours in the preheated oven. Add peas during last half hour of cooking.